Hello - my name is Sophia. I am nine years old and have lived in Singapore for five months. 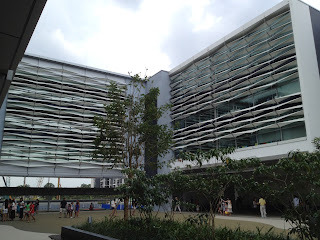 This is my first blog post from Singapore! 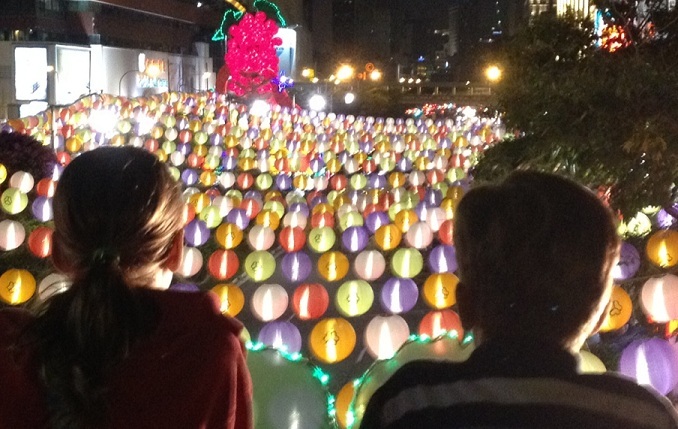 Have you ever gone to the Lantern Festival? Well, if not, you should read about it now! This weekend, as we walked through the crowded streets of Chinatown, we saw thousands of lanterns light up the sky. We also watched as an enormous red dragon danced down the street. My brother, my dad and I dropped out of the crowds and went through the busy food courts. 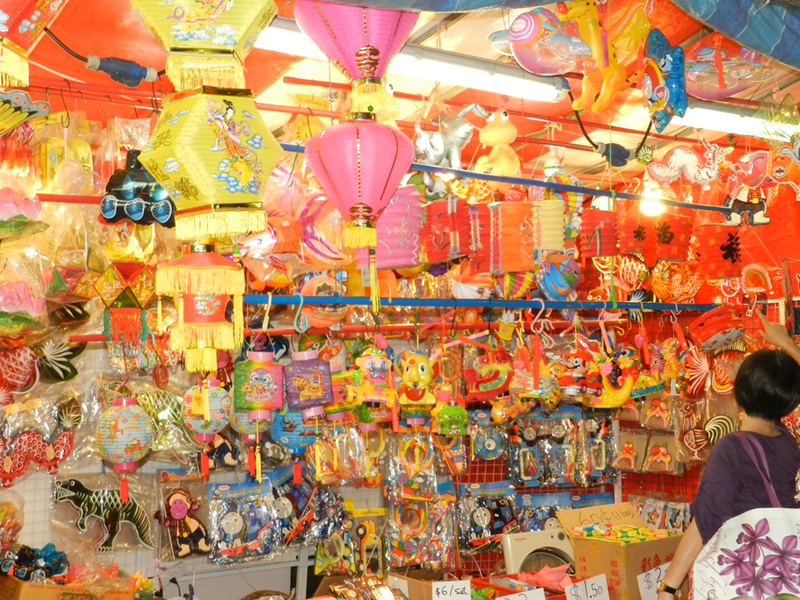 Once we broke free of the food courts, we saw hundreds of tiny shops, overflowing with souvenirs such as beautiful chinese lanterns, colorful dragon puppets, and a huge variety of mooncakes. We then found and bought our lanterns and went home to relax for the rest of the night. Now you know what the Lantern Festival is like, so I hope you visit next year! 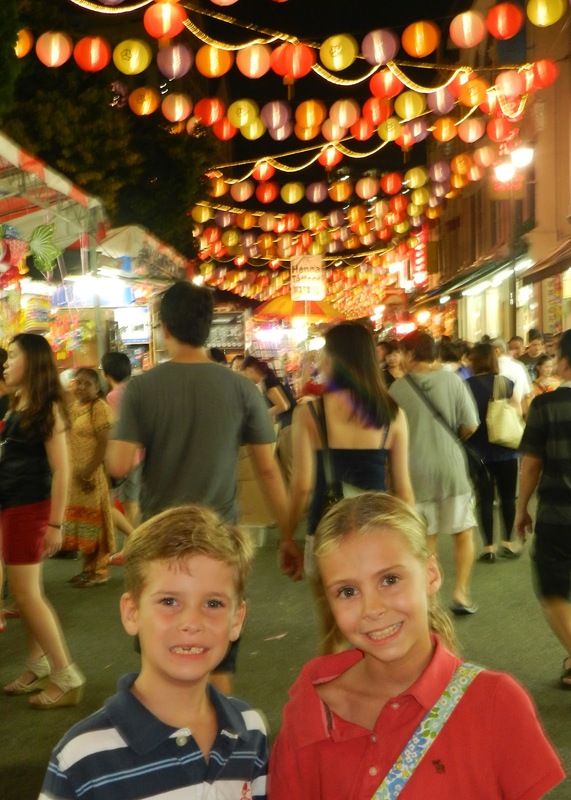 Yes - our outing to the 2012 Mid-Autumn Festival (also recognized as the Lantern Festival or Mooncake Festival) was a nice family adventure. Unfortunately, Jennifer was continuing to recover from her broken leg, so Sophia, Cooper and I were on this excursion without her. The festival is a traditional Chinese harvest festival, celebrated on the 15th day of of the eighth Chinese lunar month (try saying that 5 times fast). From what I've gathered, the festival, lanterns and mooncakes are linked to a mythical moon goddess, Chang E. The 15th day of the 8th lunar month is the day called "Mid-Autumn" and the night of the 15th day of the 8th lunar month is known as the "Night of the Moon". The festival itself is one of the four most important Chinese holidays...and they really celebrate it in Singapore! We made our way to the festival and immediately recognized the crowds - even several MRT stops away. 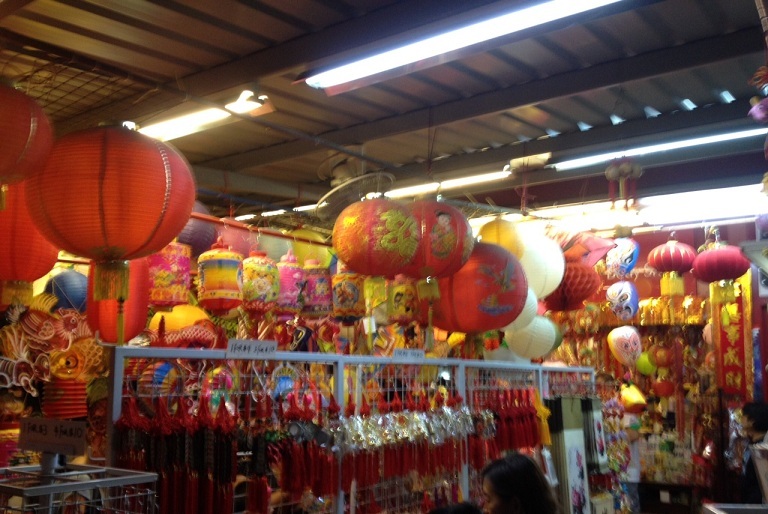 Upon arriving in Chinatown, several streets were cleared for a pending parade, so we made our way to the side streets to look for souvenir lanterns and explore the hundreds of shopping stalls. As Sophia noted, we saw everything from decorative lanterns to medicinal oddities (like snakes, centipedes, and mice in a jar) Luckily, I was feeling relatively healthy, so we skipped the local Obamacare offerings and focused on lanterns for the kids. 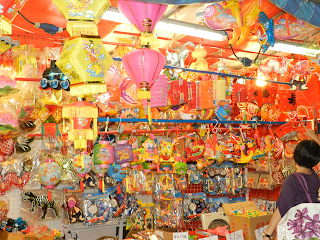 Every stall carried their own unique variety of lanterns. Some were very traditional, others included Angry Bird, Hello Kitty and other themed lanterns. We stuck with the traditional style and found lanterns both kids really liked after checking a dozen or so stalls to compare prices and negotiate reasonable prices. 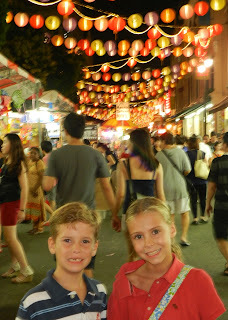 Aside from the lanterns, the festival (and Chinatown in general) had a very energetic vibe. Restaurants are mixed among the shopping stalls and the air was filled with the smells of fish ball soup and flame grilled chicken, seafood and other "stuff" that I could not identify by sight or smell. Still - it all looked and smelled amazing. The crowd was a mix of locals and tourists, with everyone seemingly enjoying the festival and the sights and sounds that came with it. As far as the "mooncakes"... in these we did not partake. I've heard co-workers describe them as similar to donuts, but I insist they don't even come close to a Krispy-Kreme or Dunkin Donuts Boston Creme in my opinion. Once the ingredients were discussed - lard, flour, sugar, lotus paste, beans, double egg yolks, etc. - my assumptions were confirmed. Truth be told, I've tried a few different kinds and they are not bad... but compared to a donut? I don't think so. After visiting dozens of stalls, avoiding mooncakes, and exploring the streets of Chinatown for more than two hours, we made our way towards open streets to find a cab and a ride home. Though we didn't stick around long enough to take in the pyrotechnics or the entire parade - which concluded at 10 pm, we really enjoyed the festival and it's clearly among several activities I'm looking forward to again next year. During Kara's visit (you might remember she is my brother Greg's fiancee), we decided to rent a room at the famous Marina Bay Sands hotel, solely so we could hang out at the rooftop infinity pool for two days. Just for background, the Marina Bay Sands is the most expensive standalone casino in the world, at the cost of $8 billion, and is the largest public cantilevered building in the world. It is kind of cool. Kara and I took the kids over in the afternoon, checked into our room and hit the pool. It was a Tuesday, and it was CRAZY crowded. Let's just say our first impression was less than stellar. It was like the neighborhood swimming hole on July 4, but crammed with people who do not understand the meaning of personal space, kids who embody the reason I dislike most kids, and idiot adults trying to swim LAPS. All in a pool clearly not meant for lap swimming, and if you can't raise proper children, leave them at home with the helper I know you have. Let's face it, you come to this pool for the view and for the cocktails. Which brings me to my next point. I don't know about you, but if I'm paying $20 for a mojito, I expect to be able to taste the rum. Even a little. So I convinced Kara that this was unacceptable and she, being a decade younger than I am, needed to ask the bartender politely to top us off a little. To say "no dice" is an understatement. The next two hours were spent plotting our takedown of the hotel. You would have thought Kara asked him to comp our room, give us a free steak dinner at the Joel Robuchon restaurant and loan out a tiger for our wake-up call... not put a splash of liqueur on a drink they are making a 90% profit on. The only saving graces were awesome spring rolls and french fries. I can't even believe I wrote that. Just beautiful. Weird but beautiful. The lotus-shaped object is the ArtScience Museum. Again, on the way to Merlion Park, not sure what this is though! But I love disco! So we went back to the hotel, Jason met us after work and we all ended up giving the pool another go after it got dark. I'm very happy we did. This time the crowd was manageable (it was actually relaxing) and the view was amazing. Do not think for a second think we forgave them for the previous mojito incident though. A good view does not make up for that, my friends. When we got back to the room, I was *this close* to letting my anger go when I saw how cute my kids looked in the hotel robes. My gracious husband then took the kids home, leaving us ladies a night out on the town. Oh boy. I definitely don't look this cute in a robe! The MBS has lots of restaurants but really, no *fun* bars, and these ladies were looking for fun. So we headed to party central AKA Clarke Quay. Clarke Quay is a really nice area on the river with tons of restaurants and bars...the place you want to be seen when you're 25. Bring it on. By the time we even headed out it was 11pm, which is not far off my bedtime so I was a little nervous. We were starving so we picked a small pizza place to grab some late dinner, and then everything I predicted would happen proceeded to happen. First, Kara made friends with the bartender and the chef and got both of their life stories. (see pics) We did a random shooter (colorful, right?). Then we made our way to a bar, the Highlander, with a live band, and proceeded to make friends with all of them. (in the way that you can make friends with people you hang out with for a couple of hours in the dark, while drinking beer) Okay, Kara definitely infiltrated their little group way better than me. I was just concentrating really, really hard on keeping my senses and being a respectable wife and mom. I still hung on every word of the people telling me I don't look 39. Lie to me, lie to me, ALL NIGHT LONG. I will believe you. Some kind of Kahlua shooter, too girly for me. See...I exist! I'm with the band! So after watching Kara work her social magic, and belting out some Bon Jovi tunes as loudly as we possibly could, I forced us out by 2am. Take my advice, nothing good happens after 2am. Especially when you're wearing very high heels that you wear twice a year (go back and read THIS POST). While typing I can see my crutches leaning against the couch. It was a good time, but I think I've seen enough of the Marina Bay Sands for a while. I am, however, dying to go back to listen to that band again. I guess I should get out the Wii karaoke during my recovery -- I have *just* a little room to improve on "Livin on a Prayer". Just a little. And Jason cannot wait to listen to it. So many people have asked me questions about what kind of school Sophia and Cooper go to that I've decided it warrants a post. Besides the curiosity of my friends, I'm hoping that potential Singapore expats might find it useful. I remember spending countless hours scouring the expat forums (which honestly are pretty nasty places, there are some mean people with too much time on their hands) for info on housing and schools. Here's hoping I can alleviate someone's anxiety, even if just a little. And I apologize in advance that my usual attempt at humor, self-deprecating or otherwise, will not be present here. When we looked at schools, we only focused on two schools - Stamford American International School (SAIS from here on out) and Singapore American School (SAS). SAS was the established American school - one of my best friends from high school even moved here our junior year and went there! At the time we were looking, SAIS was a new school (about three years old) in a temporary campus, with the promise of moving to a larger, $300 million state-of-the-art facility for the start of the 2012 school year. For reasons that really came down to a gut feel and a better location, we chose the "riskier" of the two options, SAIS. There are many, many International schools in this tiny country, and I can speak to nothing but our own experience. So although this will no doubt come off as a commercial for our kids' school, it is just what we know. Nothing more, nothing less. SAIS currently enrolls to the 9th grade, with an additional grade being added each year for the next three years. It will house approximately 2,500 students when enrollment is at capacity, but is currently still a relatively small school. The 4th grade has four classes, with a total of about 80 students, and 21 countries are represented. How cool is that! Sophia's teacher is Australian, and her closest friend is Swedish/Finnish. Cooper's teacher is Canadian and his closest friend is Japanese. Just awesome. The curriculum is American-based, with elements of the International Baccalaureate included. Although I'm sure the kids would have done just fine in a 100% International school, we just felt more comfortable knowing that they'd not fall behind the traditional American standards. The biggest difference between school at home (we were in a PA public school) and this school here is the emphasis put on arts and exercise. The kids each have three blocks (40 min each) of PE a week, two blocks of art, one of music, one of drama (the kids love that!) and two recess breaks a day. That might turn off some people who want their kids to be drilled non-stop in the 3 R's, but I find it refreshing. They have a swimming pool, dance studio, full-sized field and even golf swing cages and a simulator. For non-core classes, they also have library once a week (which has an online collection too) and a grade-specific assembly to discuss issues such as empathy towards classmates and present the weekly merit awards. Each year in music class, the entire grade learns a new instrument: Cooper's 2nd grade is learning xylophone and Sophia's 4th grade is learning the ukulele. 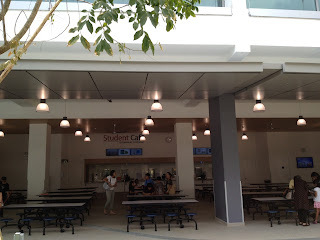 Student Cafe (they eat outside!) There is also a separate parent/teacher cafe. Instead of the inefficient process of "teaching to the test" we find at home (I understand the idea behind it, but it is just not working), the children are given an assessment at the beginning of the year to find out what level they are at in reading and math (science in the upper grades is also included) so they can be taught appropriately. When you bring so many kids in from so many places, it is necessary for subjects be "leveled". I am curious to see how that works in the class, with so many ability levels, but I'm so far feeling good that the teaching will be effective. Not only is math leveled, but for two blocks a week, the kids go to a separate math enrichment class (different teacher) for additional smaller group learning. This picture is to show how tiny Sophia is! As far as language goes, all students (starting in preschool) have daily classes in either Spanish or Mandarin Chinese. My children take Mandarin, but I'm totally conflicted on this subject. Of course that seems logical, being that we live in Asia, but it will be much easier for the kids to continue with Spanish back in the US. The schools at home offer Spanish at a young age, but not even the high schools offer Chinese (hopefully by the time they get there!). So I'm not sure how that will pan out, but for now I'm really thankful for the exposure. Cooper's favorite class is his iPad class! All students from preschool to grade 5 get their own iPads and have one block a week dedicated to learning how to use the iPad to best complement their studies. Middle and high school students get Macbooks. It's not just a silly perk, they really have fully thought out how to integrate the technology into the curriculum. The kids made welcome videos for the parents for back to school night, and parents were even asked to fill out questionnaires on their core values and hopes for their students on an iPad document. They can also read books from the school's e-library and have a ton of apps to complement their lessons. For example, Sophia was studying Gandhi last week and came home very excited. The class watched a short video, had a lengthy class discussion, then were tasked with using the iPad to find out more and answer questions. I learned more about India-Pakistan relations while listening to her than I had ever learned in school my entire life. This was only her second week of school. (Note: my kids love the Science360 app and it's free - download it!) In addition, there is a videoconferencing room that will be used to Skype with guest speakers. I have never been a believer that technology is imperative in the classroom (still think learning can be completely effective without it in the younger grades) but I'm impressed with the way it is being incorporated into the day. All kids learn differently, and I'm betting this multi-faceted approach is going to be pretty effective. After-school activities are huge - there are both official school athletic teams and an extensive schedule of music, craft, dance, martial arts...tons of classes all taught by the teachers. Both Cooper and Sophia play basketball - Cooper on an intramural team and Sophia on the school team (she will travel to other schools to compete). There is even a robotics class! (which of course Cooper wanted to sign up for but he wasn't old enough). An activity bus takes the kids to a drop off point down the road from my house, and either I will pick them up or they will take a public bus home from there (yes, alone!). There are so many other things I could highlight but honestly we're only three weeks into the year and the jury is still out on what they actually learn. The infrastructure certainly seems there, so I have high hopes. As with any new school, I'm sure there will be plenty of kinks to work out, but I'm willing to roll the dice. Please feel free to email me (jenniferludt@hotmail.com) if you're deciding on schools and want further info on what I think as the year goes on. What's most important to me is that the kids are up eager to go to school, and come home happy every day. To my delight, Cooper came home from school on Thursday, got himself a snack, sat down at the dining room table and proclaimed, "I love my life!" It doesn't get any better than that. For more on SAIS, visit their website. I have since repatriated (March 2014) to the United States, so am no longer answering questions on SAIS, but I can reiterate that my children had a fantastic experience there. Best of luck to you! Want to hear my thoughts on the school a year later (Aug 2013)? Read my follow-up post! **It would be irresponsible not to communicate that this school is expensive. Ipads, golf simulators etc. are great, but come at a cost. We are very fortunate that we are not responsible for the tuition, as we could never afford this at home. 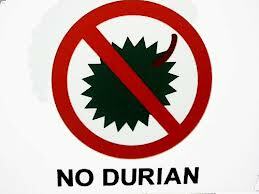 No Durians on the Bus! So I had totally planned on one or two posts detailing Aunt Kara's trip to Singapore, but it's too overwhelming so I'm just going to post several shorter posts on some of the yummy, relaxing and sometimes downright zany things we did with our first guest! The edible fruit of a tree, Durio zibethinus, of the bombax family, of southeastern Asia, having a hard, prickly rind, a highly flavored, pulpy flesh, and an unpleasant odor. Well that is certainly accurate - the unpleasant odor part that is. So much so that it is literally banned on buses. What Jason thought was a sign indicating you cannot bring a bomb on the bus (because everyone needs to be told that), the sign he saw actually meant NO DURIANS. But isn't it weird that it is in the "bombax family" of fruit? I'm pretty sure MacGuyer would be interested in this.) Rest assured durian police, I will not be sneaking one onto the #7 bus anytime soon. One of the things I loved about Kara's visit was that she had a short, but specific list of things she wanted to do or try here. One was, you guessed it...try a durian. Well it just so happens that within walking distance of our apartment there is a durian stand open for just a couple of hours every night in a random bus parking lot (ironic, huh?). Honestly it hadn't occurred to me to go there, so late one night the three girls (Sophia was totally game) headed into the underground world of stinky fruit. Oh what a scene. To no one's surprise, we were the only non-locals. People were just sitting at tables eating the durians. Since we were obviously completely clueless, the stand owner/worker stepped up to help us. For this post, I just googled "how to pick a durian" but in the interest of this not becoming "War and Peace", just trust me that it is a process best left to the experts. So after durian selection and preparation (everyone just eats it right then and there, which kind of makes sense considering their bus passes are deemed useless and since most taxis won't take a small dog in a carrier, I'm betting it's no dice to durian owners) we sat down and stared at our purchase. Oh and I forgot, the damn durian cost us $18! The locals probably paid $2.50 and were laughing their asses off at us idiots. It looks gross. Like something on the X-Files. Or like pale yellow oddly-shaped damaged breast implants in a huge spiny shell. Being the boring, non-experimental foodie person that I am, I just couldn't do it. Kara went for it immediately. She thought it had a faint garlic taste, but almost threw up. Which could have been disasterous. With all those eyes on us foreigners and no escape transportation she had to play it cool. Sophia even tried it!! (no go either). But I was a proud mama watching her! 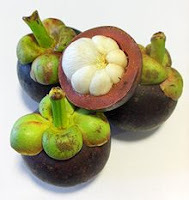 So the stand worker came over and offered us another fruit called a purple mangosteen. This too had a thick (not spiny) shell and was about the size of a nectarine. It had an odd looking semi-transparent flesh, but tasted pretty good - also similar to a nectarine. So our durian adventure came to an end and we hiked up the hill home. People sure do love their durians here. I don't know why - I will never get it - but I'm pretty sure that they wouldn't understand my intense love of Velveeta Shells and Cheese either. 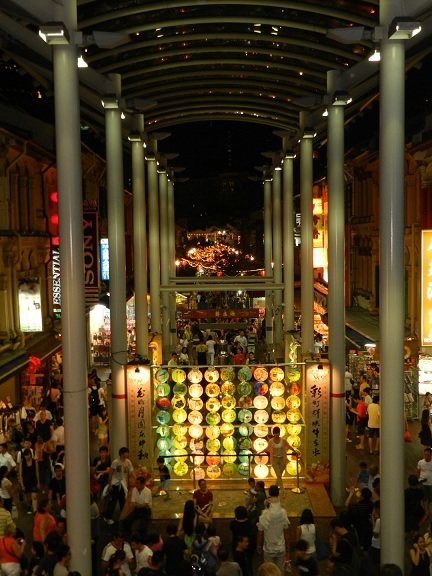 Next time - girls night out in Clarke Quay! Disclaimer: The durian stand people were nothing but nice to us, as were the other customers. They actually were amused but not in any sort of condescending way. And I really don't think they charged us more. Pure embellishment. Well well well....how things can change in an instant. Strappy pair of 5" wedge sandals + history of klutziness + 8" curb = ? Answer: A broken (clean in half) tibia bone and fracture of the fibula in my left leg. 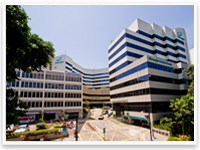 So off we went by taxi to the Gleneagles Hospital emergency room just down the road. After being triaged and x-rayed quickly (the x-ray tech couldn't even hide her dismay at the scan), I was admitted and awaiting the verdict from the orthopedic surgeon. I was totally taken aback and thought it completely refreshing that all of the doctors introduced themselves by their first name. My surgeon, "KC", was wearing khaki shorts, a short-sleeved buttoned-down shirt and flip flops. I don't know, maybe some people would be nervous at the laid back feeling, but honestly it made me more at ease. He was very friendly and explained what I had done (um, been an idiot?) and gave me two clear options for putting me back together. Option #2: Metal plate and screws surgically inserted to mend the broken bone. He recommended the surgery and I was in agreement. Keep in mind that this is the leg with the dreadful knee that has gone through six surgeries, including three ACL reconstructions, and is already arthritic. Chop it off and be done with it....I was sure that would be option #3. Alas, it was not. So just three hours later, I was ready to get the party started. I was wheeled into the operating room and the 2.5 hour surgery took place (KC had changed into scrubs in case you were wondering :-). During my sleepover at the hospital that night, all of the nurses were great (can't say the same about the food) and I guess I was as comfortable as I could be under the circumstances. That may have had something to do with the steady stream of painkillers and an Ambien. Here are the post-surgery x-rays. Airport security - now even more fun!! I was shocked to find out the next day that I would have nothing but a few bandages covering the stitch sites (4) and some plastic wrap on top. I had a compression sock over the top, but was allowed to remove that as it was actually causing additional swelling instead of preventing it. The downside of the surgery is what I'm currently dealing with - I'm on crutches and cannot bear weight on my left leg for about 8 weeks. The second half of the recovery time I will be putting 10-20% of my weight on the leg, but I can't really figure out how that is going to make a difference! So here I am, almost done with week two and I'm going nuts. There are about 40 steps up to my apartment so I really just don't get out much. Jason brought the guest daybed downstairs (It is literally under the stairs - I'm like a disabled Harry Potter with no magical powers, which would really come in handy at lunchtime.). I have wonderful neighbor friends who have taken me to the doctor, offered to do grocery shopping, helped me down to the pool to get some fresh air, lent me a chair with wheels and overall just given me emotional support. Thank you Jody, Wes, Patty, Ann Christine, Charles and anyone else I've missed. The kids have been amazing and just super helpful with anything I need. Sophia is chief dog walker and Cooper is chief worrier. Of course, I have to give a shout out to Jason, who is now Mr. Mom - making all meals, taking care of the housekeeping and getting the kids off to school every morning. I am grateful. I'm not going to lie. I'm a bit of an emotional wreck. I have never liked relying on people to do things for me, and it's killing me to ask for help. But then I remember, if this is the worst problem I have, I'm doing better than okay. In fact, after watching a marathon of "Toddlers & Tiaras" I am fully aware that my life is GREAT. Wow, people. That show is troubling. In better news, the show "White Collar" is pretty good. And if you're looking for a new book, let me know. I have several suggestions. Well I better go. Not because I have anything to do, but because I'm already starting to ramble. I can't wait until I am more mobile, so I can dig through my closet and resurrect every pair of flats I brought to this country.